I recently got the chance to see a very innovative solar home being built near Bridger Montana by Andrew Ray of Rational Design/Build. Andrew (and his frequent conspirator Clint Wicks of CW2 Construction) have been building homes for fifteen years, with Andrew getting his start with Steve Loken in Missoula. But, this time its a really special home in that its for his own family. He is a very innovative builder and careful planner, and on this home he has taken out all the stops and included all of the best energy efficiency, solar, and material saving features he has used and studied over the years. Its a fascinating home. 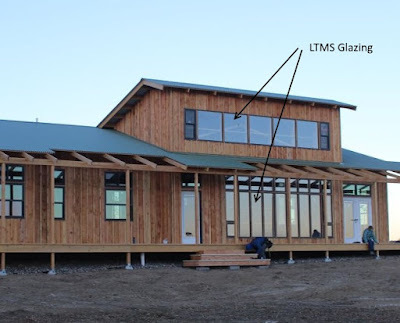 Low Thermal Mass Sunspace (LTMS) -- provides high solar fraction solar space heating with better control and more efficiency that conventional passive solar heating. The Low Thermal Mass Sunspace provides 213 sqft of glazing optimized for solar space heating. Inside-out Mooney Wall -- provides an R34 with near zero thermal bridging. A low cost, high performance wall. The walls are also very efficiently framed with continuous top of wall header and with metal bracing in lieu of sheathing. The inside-out Mooney Wall with metal bracing instead of sheathing, and continuous top header. Crawl Space Plenum -- serves as a well sealed plenum to distribute the heat from the Low Thermal Mass Sunspace and the wood burner to the house. It is constructed from Insulated Concrete Forms with a unique integrated footer design that requires no forms. The house uses many innovative techniques to minimize material use and labor. There are only eight sheets of OSB used in the entire home! Note the minimal framing that reduces material use and thermal bridging. While the home has about half the heat loss of an conventional construction home, the cost is no greater than conventional construction. A lot to be learned from this house.